According to Asger Aaboe, the origins of Western astronomy can be found in Mesopotamia, and all Western efforts in the exact sciences are descendants in direct line from the work of the late Babylonian astronomers. Our knowledge of Sumerian astronomy is indirect, via the earliest Babylonian star catalogues dating from about 1200 BCE. The fact that many star names appear in Sumerian suggests a continuity reaching into the Early Bronze Age. The history of astronomy in Mesopotamia, and the world, begins with the Sumerians who developed the earliest writing system—known as cuneiform—around 3500–3200 BC. The Sumerians developed a form of astronomy that had an important influence on the sophisticated astronomy of the Babylonians. Astrolatry, which gave planetary gods an important role in Mesopotamian mythology and religion, began with the Sumerians. They also used a sexagesimal (base 60) place-value number system, which simplified the task of recording very great and very small numbers. The modern practice of dividing a circle into 360 degrees, of 60 minutes each hour, began with the Sumerians. During the 8th and 7th centuries BCE, Babylonian astronomers developed a new empirical approach to astronomy. They began studying philosophy dealing with the ideal nature of the universe and began employing an internal logic within their predictive planetary systems. This was an important contribution to astronomy and the philosophy of science, and some scholars have thus referred to this new approach as the first scientific revolution. This new approach to astronomy was adopted and further developed in Greek and Hellenistic astronomy. Classical Greek and Latin sources frequently use the term Chaldeans for the astronomers of Mesopotamia, who were, in reality, priest-scribes specializing in astrology and other forms of divination. 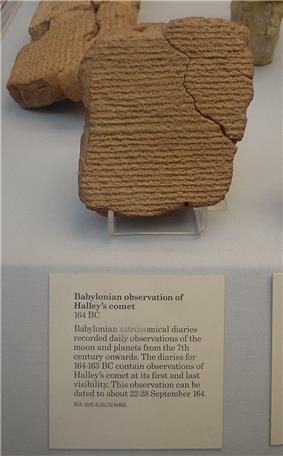 Only fragments of Babylonian astronomy have survived, consisting largely of contemporary clay tablets with ephemerides and procedure texts, hence current knowledge of Babylonian planetary theory is in a fragmentary state. Nevertheless, the surviving fragments show that, according to the historian A. Aaboe, Babylonian astronomy was "the first and highly successful attempt at giving a refined mathematical description of astronomical phenomena" and that "all subsequent varieties of scientific astronomy, in the Hellenistic world, in India, in Islam, and in the West—if not indeed all subsequent endeavour in the exact sciences—depend upon Babylonian astronomy in decisive and fundamental ways." Old Babylonian astronomy refers to the astronomy that was practiced during and after the First Babylonian Dynasty (ca. 1830 BC) and before the Neo-Babylonian Empire (ca. 626 BC). The Babylonians were the first to recognize that astronomical phenomena are periodic and apply mathematics to their predictions. Tablets dating back to the Old Babylonian period document the application of mathematics to the variation in the length of daylight over a solar year. Centuries of Babylonian observations of celestial phenomena are recorded in the series of cuneiform tablets known as the Enûma Anu Enlil—the oldest significant astronomical text that we possess is Tablet 63 of the Enûma Anu Enlil, the Venus tablet of Ammisaduqa, which lists the first and last visible risings of Venus over a period of about 21 years. It is the earliest evidence that planetary phenomena were recognized as periodic. Neo-Babylonian astronomy refers to the astronomy developed by Chaldean astronomers during the Neo-Babylonian, Achaemenid, Seleucid, and Parthian periods of Mesopotamian history. A significant increase in the quality and frequency of Babylonian observations appeared during the reign of Nabonassar (747–734 BC), who founded the Neo-Babylonian Empire. The systematic records of ominous phenomena in Babylonian astronomical diaries that began at this time allowed for the discovery of a repeating 18-year Saros cycle of lunar eclipses, for example. The Egyptian astronomer Ptolemy later used Nabonassar's reign to fix the beginning of an era, since he felt that the earliest usable observations began at this time. Though there is a lack of surviving material on Babylonian planetary theory, it appears most of the Chaldean astronomers were concerned mainly with ephemerides and not with theory. Most of the predictive Babylonian planetary models that have survived were usually strictly empirical and arithmetical, and usually did not involve geometry, cosmology, or speculative philosophy like that of the later Hellenistic models, though the Babylonian astronomers were concerned with the philosophy dealing with the ideal nature of the early universe. The only surviving planetary model from among the Chaldean astronomers is that of Seleucus of Seleucia (b. 190 BC), who supported Aristarchus of Samos' heliocentric model. Seleucus is known from the writings of Plutarch, Aetius, Strabo, and Muhammad ibn Zakariya al-Razi. Strabo lists Seleucus as one of the four most influential Chaldean/Babylonian astronomers, alongside Kidenas (Kidinnu), Naburianos (Naburimannu), and Sudines. Their works were originally written in the Akkadian language and later translated into Greek. Seleucus, however, was unique among them in that he was the only one known to have supported the heliocentric theory of planetary motion proposed by Aristarchus, where the Earth rotated around its own axis which in turn revolved around the Sun. According to Plutarch, Seleucus even proved the heliocentric system through reasoning, though it is not known what arguments he used. Many of the works of ancient cuneiform writings on clay tablets have been found, some of them related to astronomy. Most known astronomical tablets have been described by Abraham Sachs and later published by Otto Neugebauer in the Astronomical Cuneiform Texts (ACT). Since the rediscovery of the Babylonian civilization, it has become apparent that Hellenistic astronomy was strongly influenced by the Chaldeans. The best documented borrowings are those of Hipparchus (2nd century BCE) and Claudius Ptolemy (2nd century CE). Many scholars agree that the Metonic cycle is likely to have been learned by the Greeks from Babylonian scribes. Meton of Athens, a Greek astronomer of the 5th century BCE, developed a lunisolar calendar based on the fact that 19 solar years is about equal to 235 lunar months, a period relation already known to the Babylonians. In the 4th century, Eudoxus of Cnidus wrote a book on the fixed stars. His descriptions of many constellations, especially the twelve signs of the zodiac, are suspiciously similar to Babylonian originals. The following century Aristarchus of Samos used an eclipse cycle of Babylonian origin called the Saros cycle to determine the year length. However, all these examples of early influence must be inferred and the chain of transmission is not known. What Hipparchus may have done is transform these records to the Egyptian calendar, which uses a fixed year of always 365 days (consisting of 12 months of 30 days and 5 extra days): this makes computing time intervals much easier. Ptolemy dated all observations in this calendar. He also writes that "All that he (=Hipparchus) did was to make a compilation of the planetary observations arranged in a more useful way" (Almagest IX.2). Pliny states (Naturalis Historia II.IX(53)) on eclipse predictions: "After their time (=Thales) the courses of both stars (=Sun and Moon) for 600 years were prophesied by Hipparchus, ...". This seems to imply that Hipparchus predicted eclipses for a period of 600 years, but considering the enormous amount of computation required, this is very unlikely. Rather, Hipparchus would have made a list of all eclipses from Nabonasser's time to his own. ^ a b c Asger Aaboe (1958). "On Babylonian Planetary Theories". ^ A. Aaboe (May 2, 1974). "Scientific Astronomy in Antiquity". ^ a b Evans, James (1998). The History and Practice of Ancient Astronomy. Oxford University Press. pp. 296–7. ^ Holden, James Herschel (1996). A History of Horoscopic Astrology. AFA. p. 1. ^ Hermann Hunger, ed. (1992). Astrological reports to Assyrian kings. State Archives of Assyria 8. Helsinki University Press. ^ Lambert, W. G.; Reiner, Erica (1987). "Babylonian Planetary Omens. Part One. Enuma Anu Enlil, Tablet 63: The Venus Tablet of Ammisaduqa". Journal of the American Oriental Society 107 (1): 93. ^ F. Rochberg-Halton (January–March 1988). "Elements of the Babylonian Contribution to Hellenistic Astrology". ^ a b Francesca Rochberg (December 2002). "A consideration of Babylonian astronomy within the historiography of science". Studies in History and Philosophy of Science 33 (4): 661–684. ^ Norriss S. Hetherington (1993). Cosmology: historical, literary, philosophical, religious, and scientific perspectives. ^ Ulla Koch-Westenholz & Ulla Susanne Koch (1995). Mesopotamian astrology: an introduction to Babylonian and Assyrian celestial divination. ^ David Leverington (2003). Babylon to Voyager and beyond: a history of planetary astronomy. Watson, Rita; Horowitz, Wayne (2011). Writing Science Before the Greeks: A Naturalistic Analysis of the Babylonian Astronomical Treatise MUL.APIN. Leiden: Brill Academic Pub.